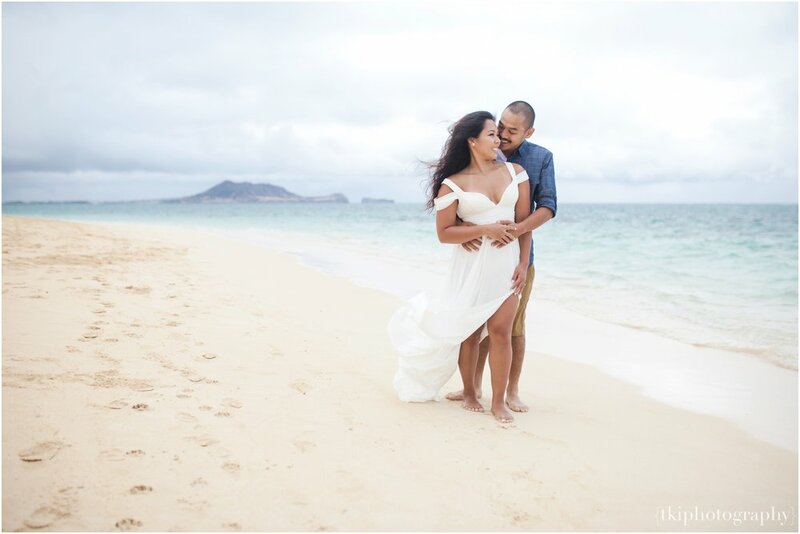 We headed to Lanikai Beach, where Johnny proposed to Liza a year prior to our session. What we had originally planned for it to be a sunny afternoon, the day turned out to be the least of what we all expected: rain, wind, and cloudy skies. The amazing about that, however, was there were not that many people on the beach...a perfect scenario for post production ;). Flown in from Stockton, CA, their vacation here on the islands was short lived...so any plans to reschedule were not in the works. So what do you do in this situation: fight or flight! Liza chose to go with it...and I must say, she totally ROCKED the entire shoot! Ring Details displayed on a Bird of Paradise. Any chance the wind slowed down, I would put them together in hope of gathering some intimate shots, making the best out of our current situation. Liza decided to change midway into the session...everything was stunning about the flow of her dress and the right amount of wind to work with her long, thick, beautiful hair. Beyond thrilled and excited for their journey together as they plan to tie the knot in Casa Real at Ruby Hill Winery this November.